Schematic two-dimensional cross-sectional view of glycogen: A core protein of glycogenin is surrounded by branches of glucose units. The entire globular granule may contain around 30,000 glucose units. 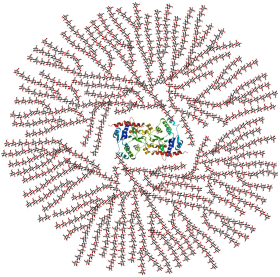 A view of the atomic structure of a single branched strand of glucose units in a glycogen molecule. Glycogen is a multibranched polysaccharide of glucose that serves as a form of energy storage in animals, fungi, and bacteria. The polysaccharide structure represents the main storage form of glucose in the body. Glycogen functions as one of two forms of long-term energy reserves, with the other form being triglyceride stores in adipose tissue (i.e., body fat). In humans, glycogen is made and stored primarily in the cells of the liver and skeletal muscle. In the liver, glycogen can make up 5–6% of the organ's fresh weight, and the liver of an adult weighing 70 kg can store roughly 100–120 grams of glycogen. In skeletal muscle, glycogen is found in a low concentration (1–2% of the muscle mass) and the skeletal muscle of an adult weighing 70 kg stores roughly 400 grams of glycogen. The amount of glycogen stored in the body—particularly within the muscles and liver—mostly depends on physical training, basal metabolic rate, and eating habits. Small amounts of glycogen are also found in other tissues and cells, including the kidneys, red blood cells, white blood cells, and glial cells in the brain. The uterus also stores glycogen during pregnancy to nourish the embryo. Approximately 4 grams of glucose are present in the blood of humans at all times; in fasted individuals, blood glucose is maintained constant at this level at the expense of glycogen stores in the liver and skeletal muscle. Glycogen stores in skeletal muscle serve as a form of energy storage for the muscle itself; however, the breakdown of muscle glycogen impedes muscle glucose uptake, thereby increasing the amount of blood glucose available for use in other tissues. Liver glycogen stores serve as a store of glucose for use throughout the body, particularly the central nervous system. The human brain consumes approximately 60% of blood glucose in fasted, sedentary individuals. Glycogen is the analogue of starch, a glucose polymer that functions as energy storage in plants. It has a structure similar to amylopectin (a component of starch), but is more extensively branched and compact than starch. Both are white powders in their dry state. Glycogen is found in the form of granules in the cytosol/cytoplasm in many cell types, and plays an important role in the glucose cycle. Glycogen forms an energy reserve that can be quickly mobilized to meet a sudden need for glucose, but one that is less compact than the energy reserves of triglycerides (lipids). As such it is also found as storage reserve in many parasitic protozoa. Glycogen is a branched biopolymer consisting of linear chains of glucose residues with an average chain length of approximately 8–12 glucose units. Glucose units are linked together linearly by α(1→4) glycosidic bonds from one glucose to the next. Branches are linked to the chains from which they are branching off by α(1→6) glycosidic bonds between the first glucose of the new branch and a glucose on the stem chain. Due to the way glycogen is synthesised, every glycogen granule has at its core a glycogenin protein. Glycogen in muscle, liver, and fat cells is stored in a hydrated form, composed of three or four parts of water per part of glycogen associated with 0.45 millimoles (18 mg) of potassium per gram of glycogen. Glucose is an osmotic molecule, and can have profound effects on osmotic pressure in high concentrations possibly leading to cell damage or death if stored in the cell without being modified. Glycogen is a non-osmotic molecule, so it can be used as a solution to storing glucose in the cell without disrupting osmotic pressure. As a meal containing carbohydrates or protein is eaten and digested, blood glucose levels rise, and the pancreas secretes insulin. Blood glucose from the portal vein enters liver cells (hepatocytes). Insulin acts on the hepatocytes to stimulate the action of several enzymes, including glycogen synthase. Glucose molecules are added to the chains of glycogen as long as both insulin and glucose remain plentiful. In this postprandial or "fed" state, the liver takes in more glucose from the blood than it releases. After a meal has been digested and glucose levels begin to fall, insulin secretion is reduced, and glycogen synthesis stops. When it is needed for energy, glycogen is broken down and converted again to glucose. Glycogen phosphorylase is the primary enzyme of glycogen breakdown. For the next 8–12 hours, glucose derived from liver glycogen is the primary source of blood glucose used by the rest of the body for fuel. Glucagon, another hormone produced by the pancreas, in many respects serves as a countersignal to insulin. In response to insulin levels being below normal (when blood levels of glucose begin to fall below the normal range), glucagon is secreted in increasing amounts and stimulates both glycogenolysis (the breakdown of glycogen) and gluconeogenesis (the production of glucose from other sources). Muscle cell glycogen appears to function as an immediate reserve source of available glucose for muscle cells. Other cells that contain small amounts use it locally, as well. As muscle cells lack glucose-6-phosphatase, which is required to pass glucose into the blood, the glycogen they store is available solely for internal use and is not shared with other cells. This is in contrast to liver cells, which, on demand, readily do break down their stored glycogen into glucose and send it through the blood stream as fuel for other organs. 5)n was established by Kekulé in 1858. Glycogen synthesis is, unlike its breakdown, endergonic—it requires the input of energy. Energy for glycogen synthesis comes from uridine triphosphate (UTP), which reacts with glucose-1-phosphate, forming UDP-glucose, in a reaction catalysed by UTP—glucose-1-phosphate uridylyltransferase. Glycogen is synthesized from monomers of UDP-glucose initially by the protein glycogenin, which has two tyrosine anchors for the reducing end of glycogen, since glycogenin is a homodimer. After about eight glucose molecules have been added to a tyrosine residue, the enzyme glycogen synthase progressively lengthens the glycogen chain using UDP-glucose, adding α(1→4)-bonded glucose to the reducing end of the glycogen chain. The glycogen branching enzyme catalyzes the transfer of a terminal fragment of six or seven glucose residues from a nonreducing end to the C-6 hydroxyl group of a glucose residue deeper into the interior of the glycogen molecule. 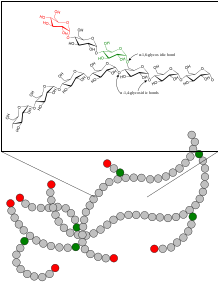 The branching enzyme can act upon only a branch having at least 11 residues, and the enzyme may transfer to the same glucose chain or adjacent glucose chains. G6P can continue on the glycolysis pathway and be used as fuel. G6P can enter the pentose phosphate pathway via the enzyme glucose-6-phosphate dehydrogenase to produce NADPH and 5-carbon sugars. In the liver and kidney, G6P can be dephosphorylated back to glucose by the enzyme glucose 6-phosphatase. This is the final step in the gluconeogenesis pathway. The most common disease in which glycogen metabolism becomes abnormal is diabetes, in which, because of abnormal amounts of insulin, liver glycogen can be abnormally accumulated or depleted. Restoration of normal glucose metabolism usually normalizes glycogen metabolism, as well. In hypoglycemia caused by excessive insulin, liver glycogen levels are high, but the high insulin levels prevent the glycogenolysis necessary to maintain normal blood sugar levels. Glucagon is a common treatment for this type of hypoglycemia. Various inborn errors of metabolism are caused by deficiencies of enzymes necessary for glycogen synthesis or breakdown. These are collectively referred to as glycogen storage diseases. Long-distance athletes, such as marathon runners, cross-country skiers, and cyclists, often experience glycogen depletion, where almost all of the athlete's glycogen stores are depleted after long periods of exertion without sufficient carbohydrate consumption. This phenomenon is referred to as "hitting the wall". Glycogen depletion can be forestalled in three possible ways. First, during exercise, carbohydrates with the highest possible rate of conversion to blood glucose (high glycemic index) are ingested continuously. The best possible outcome of this strategy replaces about 35% of glucose consumed at heart rates above about 80% of maximum. Second, through endurance training adaptations and specialized regimens (e.g. fasting low-intensity endurance training), the body can condition type I muscle fibers to improve both fuel use efficiency and workload capacity to increase the percentage of fatty acids used as fuel, sparing carbohydrate use from all sources. Third, by consuming large quantities of carbohydrates after depleting glycogen stores as a result of exercise or diet, the body can increase storage capacity of intramuscular glycogen stores. This process is known as carbohydrate loading. In general, glycemic index of carbohydrate source does not matter since muscular insulin sensitivity is increased as a result of temporary glycogen depletion. When experiencing glycogen debt, athletes often experience extreme fatigue to the point that it is difficult to move. As a reference, the very best professional cyclists in the world will usually finish a 4- to 5-hr stage race right at the limit of glycogen depletion using the first three strategies. When athletes ingest both carbohydrate and caffeine following exhaustive exercise, their glycogen stores tend to be replenished more rapidly; however, the minimum dose of caffeine at which there is a clinically significant effect on glycogen repletion has not been established. ^ William D. McArdle; Frank I. Katch; Victor L. Katch (2006). Exercise physiology: energy, nutrition, and human performance (6th ed.). Lippincott Williams & Wilkins. p. 12. ISBN 978-0-7817-4990-9. ^ Sadava; et al. (2011). Life (9th, International ed.). W. H. Freeman. ISBN 9781429254311. ^ a b c 1958-, Berg, Jeremy M. (Jeremy Mark) (2015-04-08). Biochemistry. Tymoczko, John L., 1948-, Gatto, Gregory J., Jr. (Gregory Joseph), Stryer, Lubert. (Eighth ed.). New York. ISBN 9781464126109. OCLC 913469736. ^ a b c d e f g h i Wasserman DH (January 2009). "Four grams of glucose". American Journal of Physiology. Endocrinology and Metabolism. 296 (1): E11–21. doi:10.1152/ajpendo.90563.2008. PMC 2636990. PMID 18840763. Four grams of glucose circulates in the blood of a person weighing 70 kg. This glucose is critical for normal function in many cell types. In accordance with the importance of these 4 g of glucose, a sophisticated control system is in place to maintain blood glucose constant. Our focus has been on the mechanisms by which the flux of glucose from liver to blood and from blood to skeletal muscle is regulated. ... The brain consumes ∼60% of the blood glucose used in the sedentary, fasted person. ... The amount of glucose in the blood is preserved at the expense of glycogen reservoirs (Fig. 2). In postabsorptive humans, there are ∼100 g of glycogen in the liver and ∼400 g of glycogen in muscle. Carbohydrate oxidation by the working muscle can go up by ∼10-fold with exercise, and yet after 1 h, blood glucose is maintained at ∼4 g.
^ a b Kreitzman SN, Coxon AY, Szaz KF (1992). "Glycogen storage: illusions of easy weight loss, excessive weight regain, and distortions in estimates of body composition" (PDF). The American Journal of Clinical Nutrition. 56 (1 Suppl): 292s–93s. doi:10.1093/ajcn/56.1.292S. PMID 1615908. ^ Guyton, Arthur C.; John Edward Hall (2011). Guyton and Hall Textbook of Medical Physiology. New York, New York: Saunders/Elsevier. ISBN 978-5-98657-013-6. ^ Moses SW, Bashan N, Gutman A (December 1972). "Glycogen metabolism in the normal red blood cell". Blood. 40 (6): 836–43. PMID 5083874. ^ Ingermann RL, Virgin GL (1987). "Glycogen content and release of glucose from red blood cells of the sipunculan worm themiste dyscrita" (PDF). J Exp Biol. 129: 141–9. ^ Miwa I, Suzuki S (November 2002). "An improved quantitative assay of glycogen in erythrocytes". Annals of Clinical Biochemistry. 39 (Pt 6): 612–13. doi:10.1258/000456302760413432. PMID 12564847. ^ Oe Y, Baba O, Ashida H, Nakamura KC, Hirase H (June 2016). "Glycogen distribution in the microwave-fixed mouse brain reveals heterogeneous astrocytic patterns". Glia. 64 (9): 1532–45. doi:10.1002/glia.23020. PMC 5094520. PMID 27353480. ^ Campbell, Neil A.; Brad Williamson; Robin J. Heyden (2006). Biology: Exploring Life. Boston: Pearson Prentice Hall. ISBN 978-0-13-250882-7. ^ Ryley, JF (March 1955). "Studies on the metabolism of the protozoa. 5. Metabolism of the parasitic flagellate Trichomonas foetus". The Biochemical Journal. 59 (3): 361–9. doi:10.1042/bj0590361. PMC 1216250. PMID 14363101. ^ Benchimol, Marlene; Elias, Cezar Antonio; De Souza, Wanderley (December 1982). "Tritrichomonas foetus: Ultrastructural localization of calcium in the plasma membrane and in the hydrogenosome". Experimental Parasitology. 54 (3): 277–284. doi:10.1016/0014-4894(82)90036-4. ISSN 0014-4894. ^ Mielewczik, Michael; Mehlhorn, Heinz; Al-Quraishy, Saleh; Grabensteiner, E.; Hess, M. (1 September 2008). "Transmission electron microscopic studies of stages of Histomonas meleagridis from clonal cultures". Parasitology Research. 103 (4): 745–50. doi:10.1007/s00436-008-1009-1. ISSN 0932-0113. PMID 18626664. ^ Manners, D. J. Carbohydr. Polym. 1991, 16, 37. ^ Berg, Tymoczko & Stryer (2012). Biochemistry (7th, International ed.). W. H. Freeman. p. 338. ISBN 978-1429203142. ^ Berg; et al. (2012). Biochemistry (7th, International ed.). W. H. Freeman. p. 650. ^ "Glycogen Biosynthesis; Glycogen Breakdown". oregonstate.edu. Retrieved 2018-02-28. ^ F. G. Young (1957). "Claude Bernard and the Discovery of Glycogen". British Medical Journal. 1 (5033 (Jun. 22, 1957)): 1431–37. doi:10.1136/bmj.1.5033.1431. JSTOR 25382898. PMC 1973429. PMID 13436813. ^ "Methods of Endurance Training Part 1". 2009-10-30. ^ "Steady State vs. Tempo Training and Fat Loss". 2008-06-02. ^ McDonald, Lyle (2012-07-25). "Research Review: An In-Depth Look Into Carbing Up On The Cyclical Ketogenic Diet". Retrieved 19 February 2017. ^ "Costill DL et. al. Muscle glycogen utilization during prolonged exercise on successive days. J Appl Physiol (1971) 31: 834–38." ^ Pedersen DJ, Lessard SJ, Coffey VG, et al. (July 2008). "High rates of muscle glycogen resynthesis after exhaustive exercise when carbohydrate is coingested with caffeine". Journal of Applied Physiology (Original article). 105 (1): 7–13. doi:10.1152/japplphysiol.01121.2007. PMID 18467543. ^ Gaudet, Laura; Jackson, Allen; Streitz, Carmyn; McIntire, Kyle; McDaniel, Larry. "The Effects Of Caffeine On Athletic Performance". Clute Institute. Retrieved 17 June 2014. ^ a b Beelen M, Burke LM, Gibala MJ, van Loon LJC (December 2010). "Nutritional strategies to promote postexercise recovery". International Journal of Sport Nutrition and Exercise Metabolism. 20 (6): 515–32. doi:10.1123/ijsnem.20.6.515. PMID 21116024. Wikimedia Commons has media related to Glycogen. This page was last edited on 25 March 2019, at 00:57 (UTC).